If you’ve invested in solar panels, protect them by keeping them free of dirt, debris and dust. They’re fantastic assets to own because they can save you heaps of money. Especially with the rising costs of power. However, if you neglect them, then their efficiency could reduce drastically because what accumulates on them over time won’t get washed off with a simple shower of rain. They’ll reduce the amount of power your panels produce. The best solution is to regularly wash the panels so they always operate at their highest capacity. We don’t recommend that you try doing this yourself unless you’re a professional solar panel cleaner. If you’re not a professional, then that’s where we come in. Hire an experienced solar panel cleaner to ensure you don’t use the types of brushes and detergents that could damage your solar panels and affect the manufacturer’s warranty! At Shazam Window Cleaning, we wash solar panels for residential and commercial clients in the southern suburbs of Perth through to Dawesville. We’re able to do this at a reasonable price that won’t break the bank because we use high-quality yet cost-effective techniques and tools that help us complete the job faster than would a traditional cleaning service. We only use gentle cleaning products and equipment approved by solar panel manufacturers. This involves eco-friendly cleaning solutions that won’t affect your solar panels. We also use a water fed pole technology that has a soft-bristled brush and a jet spray of 100% pure water. All this combined with our expert skills will make your solar panels look squeaky clean and dirt free. 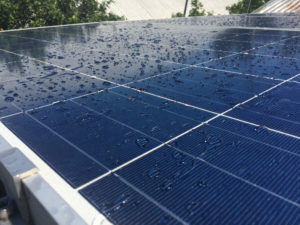 Call us on 0414 820 986 to learn more about our solar panel cleaning services for homes and businesses in the southern suburbs of Perth down to Dawesville. We’d be more than happy to provide a free quote.